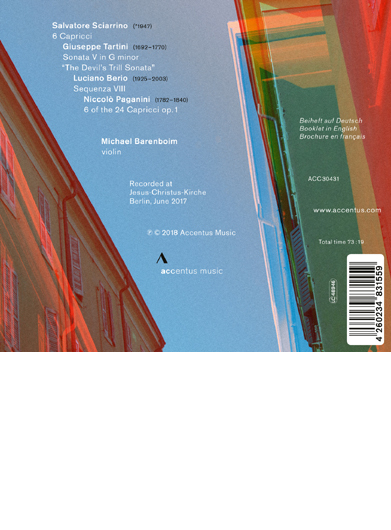 After his debut solo album with music by Bach, Bartók and Boulez, Michael Barenboim’s second album is also dedicated to works for solo violin and features compositions by Salvatore Sciarrino, Giuseppe Tartini, Luciano Berio, and Niccolò Paganini, sketching a short history of Italian solo violin literature. The four works seem very heterogenous at first glance but what unites them is their rich technical and stylistic spectrum. The juxtaposition of traditional and contemporary music works creates an inimitable sound cosmos and makes the works by Tartini and Paganini sound incredibly modern alongside 20thcentury music. Michael Barenboim creatively navigates the sometimes obsessive and diabolical elements of the works and creates an inspired and unique interpretation. Michael Barenboim wrote about his thoughts on Paganini in The Strad: Learning how to lose control is Paganini’s gift to violin music.